Well it's Tuesday again, and you know what that means.. IBM announcements! Today, IBM announces that next Monday marks the 60th anniversary of first commercial digital tape storage system! I am on the East coast this week visiting clients, but plan to be back in Tucson in time for the cake and fireworks next Monday. 1947 - Bing Crosby adopts audio recording for his radio program. This eliminated him doing the same program live twice per day, perhaps the first example of using technology for "deduplication". According to the IBM Archives the [IBM 726 tape drive was formally announced May 21, 1952]. It was the size of a refrigerator, and the tape reel was the size of a large pizza. The next time you pull a frozen pizza from your fridge, you can remember this month's celebration! When I first joined IBM in 1986, there were three kinds of IBM tape. 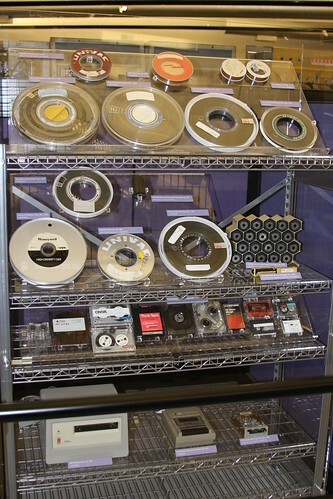 The round reel called 3420, and the square cartridge called 3480, and the tubes that contained a wide swath of tape stored in honeycomb shelves called the [IBM 3850 Mass Storage System]. My first job at IBM was to work on DFHSM, which was specifically started in 1977 to manage the IBM 3850, and later renamed to the DFSMShsm component of the DFSMS element of the z/OS operating system. This software was instrumental in keeping disk and tape at high 80-95 percent utilization rates on mainframe servers. While visiting a client in Detroit, the client loved their StorageTek tape automation silo, but didn't care for the StorageTek drives inside were incompatible with IBM formats. They wanted to put IBM drives into the StorageTek silos. I agreed it was a good idea, and brought this back to the attention of development. In a contentious meeting with management and engineers, I presented this feedback from the client. Everyone in the room said IBM couldn't do that. I asked "Why not?" The software engineers I spoke to already said they could support it. With StorageTek at the brink of Chapter 11 bankruptcy, I argued that IBM drives in their tape automation would ease the transition of our mainframe customers to an all-IBM environment. Was the reason related to business/legal concerns, or was their a hardware issue? It turned out to be a little of both. On the business side, IBM had to agree to work with StorageTek on service and support to its mutual clients in mixed environments. On the technical side, the drive had to be tilted 12 degrees to line up with the robotic hand. A few years later, the IBM silo-compatible 3592 drive was commercially available. Rather than put StorageTek completely out of business, it had the opposite effect. Now that IBM drives can be put in StorageTek libraries, everyone wanted one, basically bringing StorageTek back to life. This forced IBM to offer its own tape automation libraries. In 1993, I filed my first patent. It was for the RECYCLE function in DFHSM to consolidate valid data from partial tapes to fresh new tapes. Before my patent, the RECYCLE function selected tapes alphabetically, by volume serial (VOLSER). My patent evaluated all tapes based on how full they were, and sorted them least-full to most-full, to maximize the return of cartridges. Different tape cartridges can hold different amounts of data, especially with different formats on the same media type, with or without compression, so calculating the percentage full turned out to be a tricky algorithm that continues to be used in mainframe environments today. The patent was popular for cross-licensing, and IBM has since filed additional patents for this invention in other countries to further increase its license revenue for intellectual property. In 1997, IBM launched the IBM 3494 Virtual Tape Server (VTS), the first virtual tape storage device, blending disk and tape to optimal effect. This was based off the IBM 3850 Mass Storage Systems, which was the first virtual disk system, that used 3380 disk and tape to emulate the older 3350 disk systems. In the VTS, tape volume images would be emulated as files on a disk system, then later moved to physical tape. We would call the disk the "Tape Volume Cache", and use caching algorithms to decide how long to keep data in cache, versus destage to tape. However, there were only a few tape drives, and sometimes when the VTS was busy, there were no tape drives available to destage the older images, and the cache would fill up. I had already solved this problem in DFHSM, with a function called pre-migration. The idea was to pre-emptively copy data to tape, but leave it also on disk, so that when it needed to be destaged, all we had to do was delete the disk copy and activate the tape copy. We patented using this idea for the VTS, and it is still used in the successor models of IBM Sysem Storage TS7740 virtual tape libraries today. Today, tape continues to be the least expensive storage medium, about 15 to 25 times less expensive, dollar-per-GB, than disk technologies. A dollar of today's LTO-5 tape can hold 22 days worth of MP3 music at 192 Kbps recording. A full TS1140 tape cartridge can hold 2 million copies of the book "War and Peace". If you have your own "war stories" about tape, I would love to hear them, please consider posting a comment below.